Born and brought up in England, George Augustus Chichester, second Marquis of Donegall, inherited from his father in 1799 one of the greatest landed estates in Ireland ' nearly a quarter of a million acres. Since the new Lord Donegall had hitherto spent much of his time gambling on borrowed money, a host of creditors now looked for payment. Donegall disputed the legality of many of the claimes, however, and retreated to Belfast where (with the connivance of the local law officers) he defied all efforts to make him pay in full. 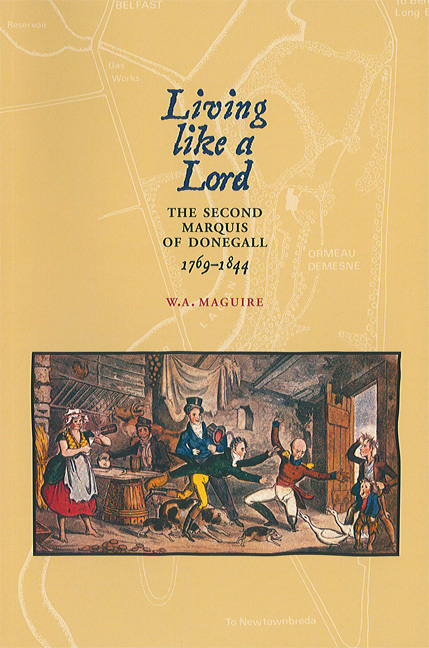 He was to live in Belfast for the rest of his life, becoming notorious as the Marquis of Done 'em all. The story of his prodigal son who became a prodigal father is full of fascinating glimpses of the lower life of the upper classes of his time ' a world of debtors' prisons, chancy deals and Chancery proceedings. Aside from this, Donegall's career is also interesting for the curious affair of his marriage. When his eldest son was about to get married in 1819, Donegall's own marriage to Anna May was declared illegal, more than twenty years after it had taken place. This made their seven children illegitimate and deprived them of their inheritance. Only a retrospective change in the law of matrimony (brought about by the Donegall case) saved the family from ruin. At a local level, Donegall's presence in the town and his insatiable need for cash had a considerable, if unintended, effect on the development of Belfast. By seriously undermining the Chichester family's wealth and influence he opened the way for the citizens to take its place.